In my quest for the most breathtakingly beautiful bath tub to grace my master bath I've come across some pretty memorable models but this one, while it's certainly unique, has me perplexed. Why frame a traditionally shaped tub with wood in this way? And why add a fold-away step? What if I climb up the steps to get into the bath and someone folds them flat; will I be trapped in the bathtub forever? What practical purpose is served by being so high off the floor? Is the frame strong enough to take the weight of the tub, gallons of water, and me? And why is it called One Top? The vibe I get from this tub is a mixture of an old Morris Traveller, an instrument of torture and a scaffold - the steps only add to the sense of trepidation. You, on the other hand, may love it. I love your dedication in finding the right tub-- and what tubs you've found! You've found the neatest tubs in your search! I have seen similar tubs while visiting Japan and in the right setting it looks beautiful. My only problem is that I am not a wood lover, so I cannot see beyond it. 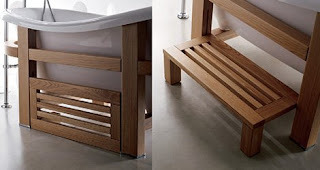 This sort of tub and wood surround sits well in a sauna like room. It have to catch up and see what other tubs you have ruled out. 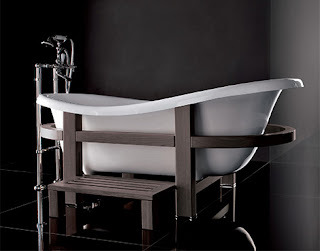 FYI: I just posted a blog on bath tubs. You might enjoy checking it out. First in a series. one problem with the lighter clawfoots is that they have a wicked tendency to tip when full of water and person. this framing eliminates that risk in an artful way.